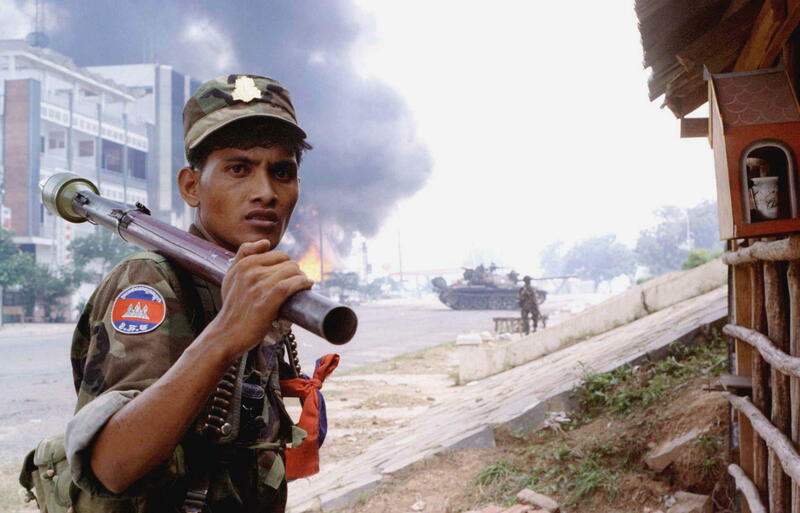 For a few days back in 1997, the shadow of civil war returned to Cambodia. The events of 20 years ago have become seared into the history of the country’s past but have never fully been explained. What is known is that a series of incidents culminated on July 5, 1997, in CPP forces attacking the Funcinpec military base of Tang Kasaing near Pochentong International Airport—today’s Phnom Penh International Airport. During the weekend of July 5 and 6, several hundred Funcinpec soldiers and officers would die in combat or by execution as Funcinpec military facilities, political headquarters and leaders’ residences were assaulted. Attacks occasionally spread to CPP critics’ quarters such as Mam Sonando’s independent Beehive Radio station that was located near the home of Funcinpec’s leader Prince Norodom Ranariddh. On July 6, soldiers stormed the station and looted about $70,000 of equipment—a fortune for him. He was away at the time but his wife—who was there—barely had time to escape through a window, he said in an interview on Tuesday. While CPP forces targeted specific Funcinpec locations and, as a whole, ordinary people’s lives were unaffected, the climate of fear and uncertainty that was created led numerous embassies to evacuate their nationals, and international aid and business organizations to delay operations, if not cancel them. And it would take at least six months before a number of non-CPP politicians would return. These events two decades ago took place in a post-war climate that was marked by uneasy alliances and situations that were virtually doomed from the start. In October 1991, the Paris Peace Agreement had been signed by the CPP government and three Cambodian factions—including the Khmer Rouge—headed by then-Prince Norodom Sihanouk. This put an end to the war between those factions and the CPP leaders who, with the support of the Vietnamese army, had ousted the Khmer Rouge regime in 1979 and have run the country ever since. Per the agreement, the U.N. was to hold a national democratic election and take over the country’s management until an elected government could do so. But as Benny Widyono—the U.N. secretary-general’s representative in Cambodia from 1993 through June 1997—pointed out, taking charge of the government was unrealistic from the start. It would have taken thousands and thousands of U.N. staff to administer ministries and provincial offices. As a result, the CPP never lost control of the government apparatus, he said in an interview. So it came as a shock when Cambodians went to the polls in May 1993 and overwhelmingly elected the royalist political party, Funcinpec, led by Prince Norodom Ranariddh, which had used its ties with Prince Sihanouk to attract voters. But the CPP refused to step down. This led Prince Sihanouk to suggest a share of power between Funcinpec and the CPP, with Prince Ranariddh as first prime minister and today’s Prime Minister Hun Sen as second prime minister. The parties accepted. It was an alliance that would always be uneasy. “Can we trace the coup in ’97 back to the coalition government that was formed after the 1993 elections on Prince Norodom Sihanouk’s suggestion, where he essentially imposed a fait accompli upon Ranariddh to join Hun Sen in that government? The question always was how this would actually work in practice,” said Peter Bartu, an Australian researcher in international relations at the University of California, Berkeley, who was a U.N. Transitional Authority in Cambodia (Untac) staff member in the early 1990s, and has studied and written extensively on Cambodia in the 1980s and 1990s. “Some people say that it was a bad idea from the beginning, that it was inappropriate, etc,” he said in an interview. “Hun Sen of course is central in all of this,” Mr. Bartu added. So the awkward alliance began with Funcinpec attempting to run ministries whose staff had been appointed in the 1980s while the CPP ran the country as a communist regime with Vietnamese support. In addition, the CPP headed by Mr. Hun Sen had lost the elections, which made some CPP members wonder whether the party should pick a new leader, Mr. Bartu said. When Funcinpec leaders and military were attacked in July 1997, it was Mr. Hun Sen’s faction within the CPP that took action, rather than the whole party. CPP leaders such as Ke Kim Yan, who was commander-in-chief of the Royal Cambodian Armed Forces (RCAF), Chea Sim, who was president of the National Assembly, and Sar Kheng, who was then co-interior minister and deputy prime minister, did not agree with the operation. “They don’t see the need to confront Funcinpec at all: Oh yes, they totally disagree with it,” Mr. Bartu said. It is even believed that Ke Kim Yan disputed deploying RCAF on the streets of Phnom Penh during the July events. While the dual prime minister formula called for an uncomfortable, if not impossible, arrangement from the start, Prince Ranariddh’s leadership style at times did not help advance work at the National Assembly or make him popular in all quarters. By 1997, things were heating up. Two matters may have prompted Mr. Hun Sen’s action. Moreover, both the CPP and Funcinpec had been negotiating with various Khmer Rouge leaders for their surrender—shortly after signing the Paris Agreement in 1991, the Khmer Rouge had broken the treaty, regained their camps along the Thai border and resumed war. During the 1980s, the CPP, assisted by Vietnam, had implemented a “win-win” policy to bring Khmer Rouge members over to the government side. On the other hand, Funcinpec and the Khmer Rouge had been allied against the Phnom Penh government throughout that decade. So both parties were familiar with them. On June 25, the CPP announced that its security chiefs were investigating claims that hundreds of Khmer Rouge soldiers were being smuggled into Phnom Penh to help fight against CPP military units. Two days later, Prince Ranariddh told The Cambodia Daily that he had enough soldiers on hand to not to need to bring in Khmer Rouge soldiers to boost his military force. “The problem is simply this. 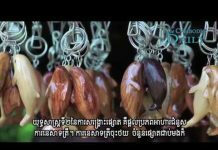 When Samdech Hun Sen [negotiates] with Ieng Sary in Malai [district], Samlot [district], Pailin [province], it’s good because it’s coming from Samdech Hun Sen. But what I am doing with Anlong Veng [the Khmer Rouge stronghold] is bad because it is coming from Prince Ranariddh. This is the difference,” he said. According to U.S. journalist Elizabeth Becker, Mr. Hun Sen had recruited more Khmer Rouge defectors than Prince Ranariddh. In late May 1997, the CPP would denounce the arms shipment that Funcinpec had received at the Sihanoukville port as proof of the party’s warring intentions. Prince Ranariddh responded that he needed the arms to protect himself from CPP forces. This was followed in June by a series of declarations and incidents, which included Funcipec and CPP bodyguards coming to blows on Norodom Boulevard near the homes of Prince Ranariddh and National Police chief Hok Lundy. When fighting erupted on July 5 with CPP forces attacking Funcinpec’s Tang Kasaing military base near the Pochentong International Airport, the country’s leaders coincidentally happened to be away: King Norodom Sihanouk in China, Mr. Hun Sen in Vietnam and Prince Ranariddh in France, as Ms. Becker noted. The CPP forces targeted some Funcinpec officials’ residences and the party headquarters next to the French Embassy on Monivong Boulevard. “The CPP had forces inside Calmette Hospital firing into the Funcinpec compound over the French Embassy,” said Bill Herod, an American and long-time resident who was setting up internet throughout the country with Canadian aid funding at the time. Cambodian and foreign residents in Phnom Penh stayed away from the target areas and bid their time, he said. On July 7, Ho Sok, who was a powerful Funcinpec secretary of state at the Interior Ministry, was arrested after he left the Singaporean Embassy, where he had sought refuge, and was later shot at the ministry. Funcinpec General Nhek Bun Chhay, the country’s first deputy chief of staff, ordered his soldiers to disperse in small groups to flee unnoticed. He made his way to the Thai border on an old motorcycle, thanks to villagers who helped him along the way, he wrote in his book “A Luck in Thousand Dangers” in 1998. “While I was on the journey,” he writes, “I sometimes had nothing to eat: sometimes for a week, sometimes for five days.” Sick with typhoid and malaria, he was saved by the staff of a humanitarian medical facility near the border in Thailand. Son Soubert, a member of the Buddhist Liberal Democratic Party and second vice president of the National Assembly, returned to Phnom Penh on July 6. But it soon became obvious to him that he had to leave the country. On July 6, Mr. Hun Sen accused Prince Ranariddh of treason during a two-hour televised speech. His next step was to vote him out of power at the National Assembly in order to legitimize his action. “They were looking for me…to vote against Prince Ranariddh,” Mr. Soubert said in an interview. As a Funcinpec parliamentarian later told him, the CPP ended up using money rather than threats to get Funcinpec parliamentarians to side with the CPP. They offered them $5,000 at first and $10,000 later on for their vote. In the end, they were never paid, he was told. With the help of several friends who lent him money, Mr. Soubert managed to get a ticket on one of the rare airlines that had not canceled its flights and get to Bangkok along with four other parliamentarians from his party and their families. Thanks to a Thai friend who provided him shelter and a car, he was able to temporarily house those 24 people in Bangkok, he said. It would be six months before Mr. Soubert could return to Cambodia. Back in Phnom Penh, by Monday, July 7, things were calming down, although soldiers loyal to the CPP were still looting the city, hauling away everything from motorbikes to refrigerators. The following day, more than 1,000 foreigners were airlifted out. Months would go by before a semblance of normalcy would return to the country. As for negotiations with the Khmer Rouge, they continued. Leaders Khieu Samphan and Nuon Chea were welcomed back to the country in December 1998 while their soldiers were either demobilized or joined the Cambodian government military forces. They, along with Ieng Sary who had obtained a royal pardon in 1996, were later tried at the Khmer Rouge tribunal. Ieng Sary died in March 2013 while on trial. Khieu Samphan, now 85, and Nuon Chea, 90, were convicted for crimes against humanity in August 2014 and given life sentences. They are awaiting verdicts in a second trial, facing charges of crimes against humanity and genocide, the final closing statements of which were heard last week. The events of July 1997 were labeled “factional fighting” in English and “pratecam,” meaning “the event” in Khmer. Had it been deemed a “coup,” it would have forced international organizations and embassies to revisit, if not halt, providing aid to the country, Mr. Soubert said. For government spokesman Phay Siphan, there is no question of the July 1997 events being a coup. An urgent response was required, and this called for “only the special forces,” he added. On July 16, 1997, French journalist Alain Gascuel, who had lived in Cambodia since 1992, summarized the events in Cambodge Nouveau, his political and business news publication. When all is told, what was it all about? As Lu Lay Sreng, who was Funcinpec deputy commerce minister at the time, pointed out on Tuesday, Mr. Hun Sen did not want Prince Ranariddh to challenge his power. “Samdech Hun Sen does not want a mountain with two tigers: He wants only one tiger,” he said.